In honor of Veteran's Day, we are extending our active duty military discount to all veterans and their dependents on Wednesday, November 11, 2015, and offering a 10% discount to veterans in our Harborview Café. Celebrate this holiday with your family as well as penguins, seals, sea lions, sea turtles and fish. 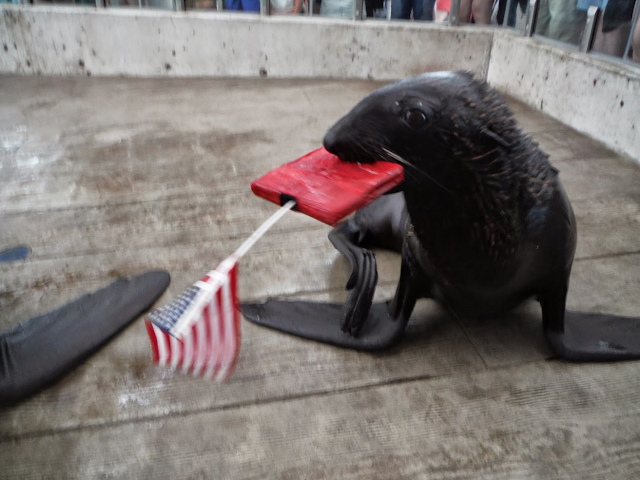 A fur seal waves a flag in the marine mammal center. The discount is available for tickets purchased at our Box Office only. Veterans must show proof of former military status (a driver's license with a veteran designation, for example). Adults will receive $10 off admission, and children receive $5 off. This discount does not apply to non-dependent guests coming with military personnel and veterans. Veterans will receive 10% off in our Café on Veterans Day by showing their ticket stub. Thank you to all our service men and women, veterans and their families.